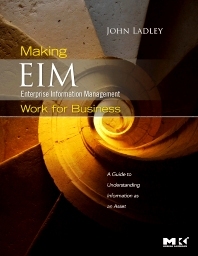 Making Enterprise Information Management (EIM) Work for Business: A Guide to Understanding Information as an Asset provides a comprehensive discussion of EIM. It endeavors to explain information asset management and place it into a pragmatic, focused, and relevant light. The book is organized into two parts. Part 1 provides the material required to sell, understand, and validate the EIM program. It explains concepts such as treating Information, Data, and Content as true assets; information management maturity; and how EIM affects organizations. It also reviews the basic process that builds and maintains an EIM program, including two case studies that provide a birds-eye view of the products of the EIM program. Part 2 deals with the methods and artifacts necessary to maintain EIM and have the business manage information. Along with overviews of Information Asset concepts and the EIM process, it discusses how to initiate an EIM program and the necessary building blocks to manage the changes to managed data and content. Upper-level Data Management Professionals. This includes CxO’s (especially CIO’s and CKO’s) and project-related staff (such as Data and Enterprise Architects) devoted to the practice of managing data and information to support business strategies. How Does Asset Treatment Deal with These? The Combined View — "A Day-in-the-Life"
How Do EIM Objectives Tie to Business Goals? The IVC — Lets Beat up Another Metaphor! John Ladley is a business thought leader and recognized authority in all aspects of Enterprise Information Management (EIM) with 35 years’ experience in planning, project management, improving IT organizations and successful implementation of information systems. John has led teams focused on improving a client’s business results through business intelligence, information management and data governance. John is widely published. John frequently writes and speaks on a variety of technology and data topics. His information management experience is balanced between strategic technology planning, project management and practical application of technology to business problems.